Once upon a time in ancient China, a Daoist monk by the name of Shan San Feng, living at the sacred Wudang Mountains, was watching a bird ferociously attacking a snake. The snake stayed calm and alert until it suddenly and fatally attacked the bird. This inspired the monk to create the soft internal martial art of taiji quan, or so the legend goes. Taiji quan literarily means the “fist (fighting method) of the supreme ultimate .” It is a set of flowing soft movements, consciously performed to cultivate and harmonize internal energy based on the Daoist principles of the ever changing dynamic relationship of Yin and Yang. 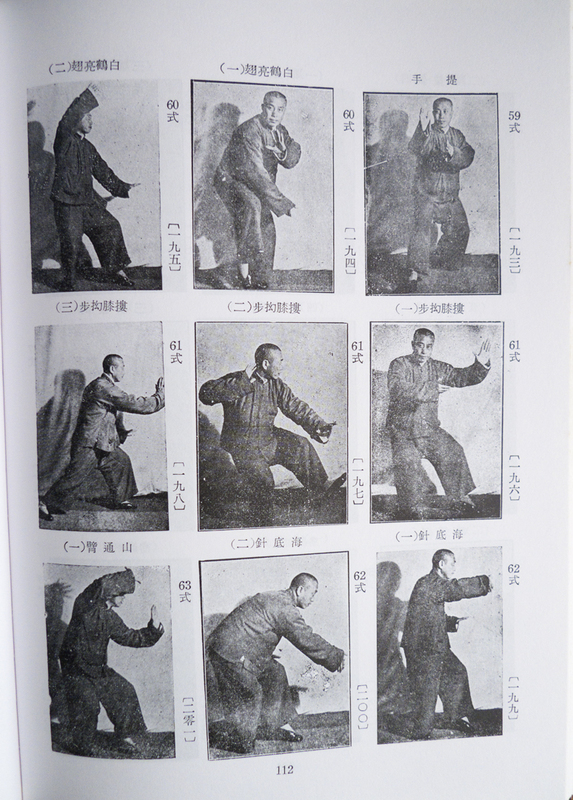 Every movement has one or several martial applications. What makes taiji different from kung fu or karate is that the practioner uses internal energy rather than muscle power, which of course takes years of diligent practice to develop. Yang Family Secret Transmissions. This book is with me since 1983. New York – Virgin Islands – Hawaii. Throughout the year of 1981 I practiced yoga out of a book and eventually looked for a teacher. An ad in a magazine I picked up in an East Village health food store attracted me. It read: Daoist Esoteric Yoga, Six Healing Sounds, 6 weeks meditation workshop. It was the Six Healing Sounds that really convinced me to take the workshop. Mantak Chia became my first master. I studied meditation, various forms of qi gong, and encountered taiji for the first time. I thought, this is what I have been looking for my whole life. I continually studied with Mantak Chia for four years, including a week long meditation retreat and the fire-walk, which inspired the song Step Into the Fire. Dieter Osten video still Step Into the Fire. My next teacher was Tzu Kuo Shih a classical Chinese renaissance man versed in taiji, qi gong, calligraphy, massage, painting and acupuncture. His own family method of acupuncture was handed down to him through seven generations. It consisted of inserting about 18 needles primarily into the head and just a few in the body. I remember best a Wudang style taiji set and his famous Swimming Dragon qi gong supposed to promote beautiful skin and a healthy level of body weight. I stayed about four years with Master Shih, until he moved to Kingston in upstate New York. Before I left the city in 1988, I learned a Chen style taiji set from Janette Chi. Swimming Dragon Qi Gong.Tzuo Kuo Shih. Cover. 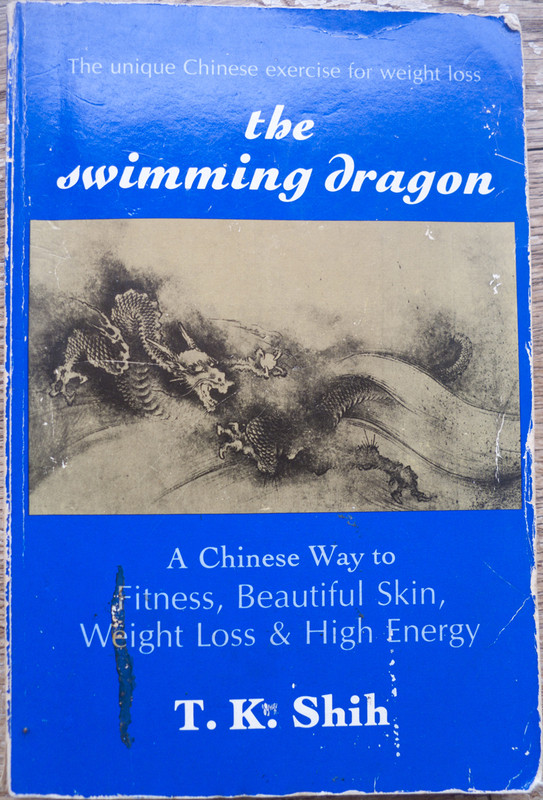 Swimming Dragon Qi Gong.Tzuo Kuo Shih from his book. In December 1990 I arrived on Oahu and since January 1991 Dong Zeng Chen has been my taiji master. For years I took four classes a week from him, his son Alex Dong and his senior students, participated in many workshops on Oahu, Maui and Hawaii Island and traveled to China and Hong Kong with him. Since 1992 I have been teaching taiji in Kailua and Kaneohe on Oahu’s windward side. In 1999 I took my first art class, which eventually lead to my MFA in 2008. I did drawings on taiji, linoleum and woodcut prints and in the summer of 2003 I painted one hundred small oil paintings inspired by Tung Ying- chieh, master Dong’s grandfather. 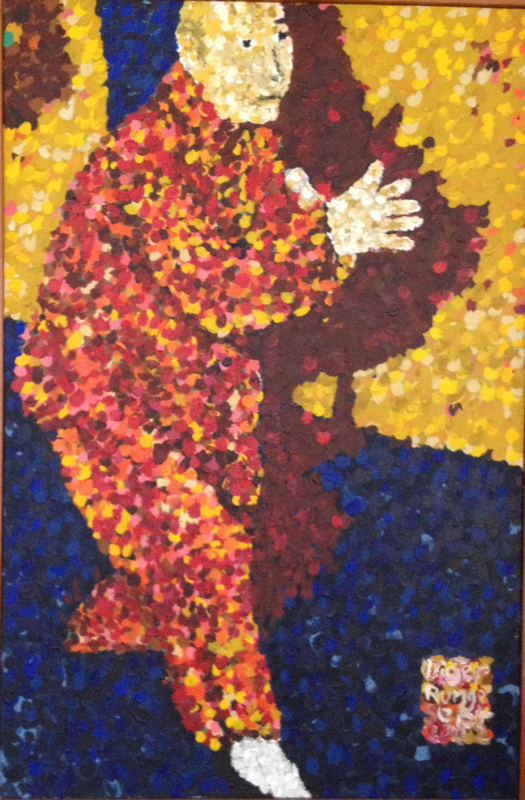 One of my first ever paintings, acrylic on canvas, ca 2001, after Tung Yin Chieh. 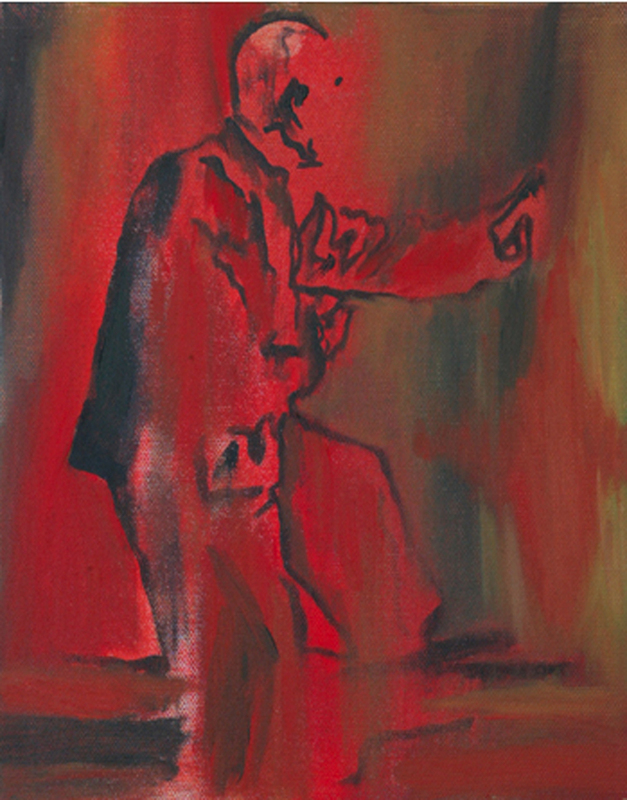 oil on canvas, 8×10, dieter runge, 2003. From 100 Views of Taiji. 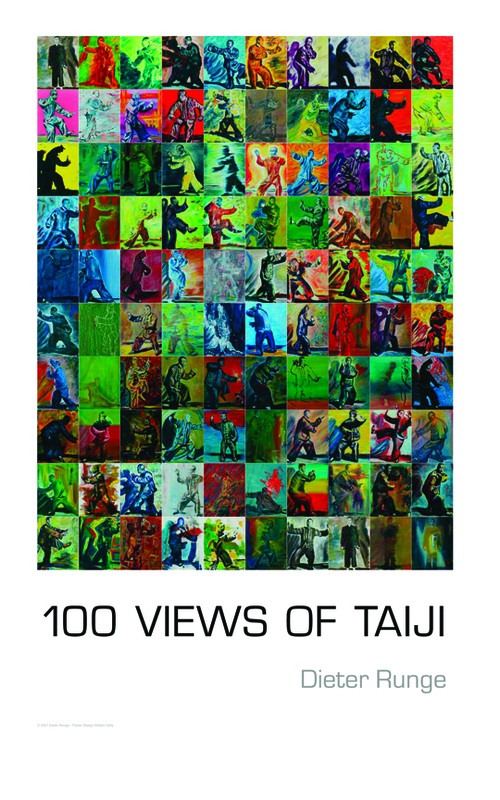 Thanks to the Grace Chui and Sylvain Deschenes from the Montreal Tai Chi Club and its webmaster Danielle Kapochena all paintings of the 100 Views of Taiji are accessible to you. There are several major taiji styles based on the names of families and the villages of their origins. 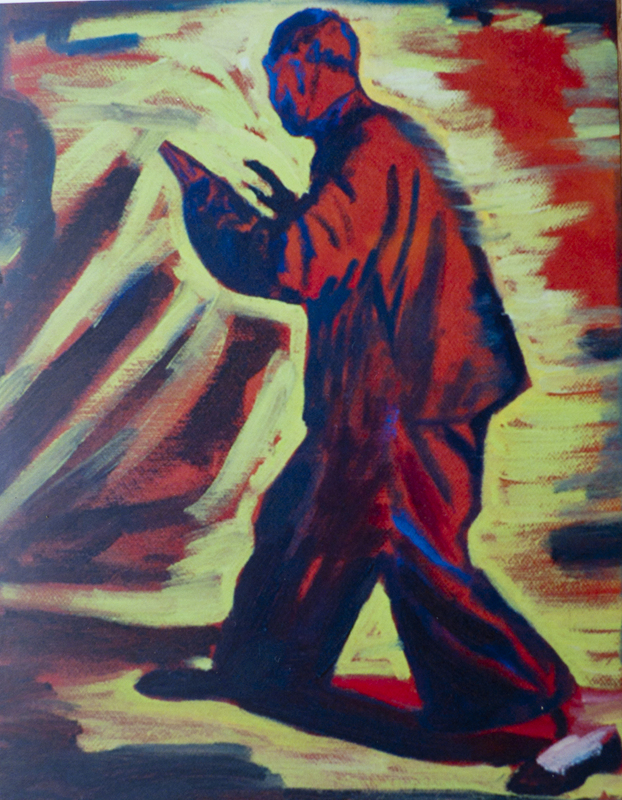 They are Chen, Yang, Wu and Sun, and others like the Wudang style, Dong style (now officially recognized) and the simplified Chinese Government style. 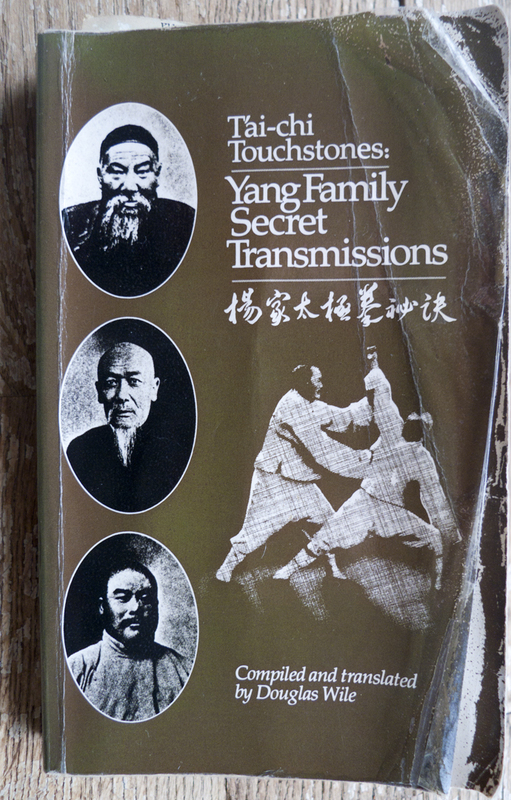 The Dong family’s strong taiji tradition was continued after Tung Ying-chieh, one of the main disciples of Yang Ch’eng-fu, the founder of the popular Yang style, through his son and daughter Tung-Fu-ling and Jasmin Tung, my teacher Dong Zeng Chen, his brother Tung Kai Ying, and their sons Alex Dong and Tung Chen Wei. The Tung/Dong family is known in the taiji world for the martial abilities and in 2006 I was fortunate to participate in a gathering of all the masters of the family and students from all over the world. It was an amazing experience, that still moistens my eyes just writing about it. I was allowed to show my taiji paintings and prints and sold many. 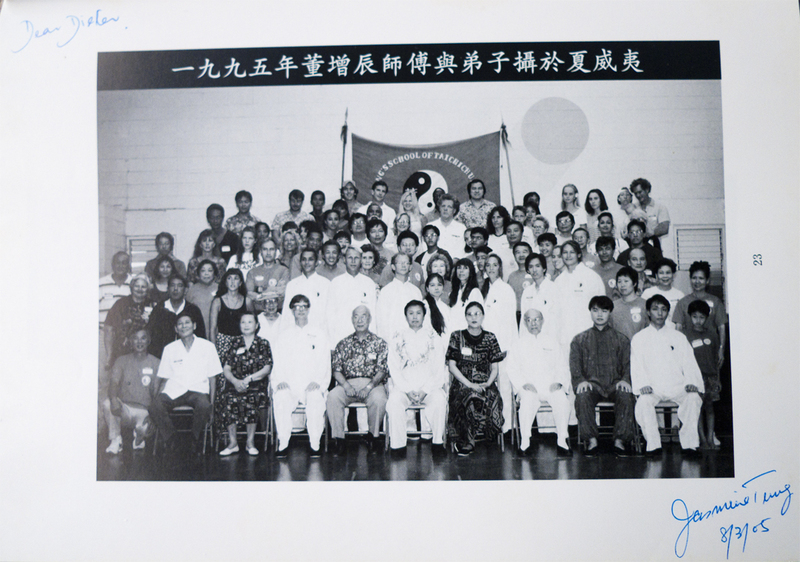 Dong Zeng Chen (front center) class photo. Pali Pre School early 90’s. Author, 2nd row, 5th from left. Signed by Jasmin Tung. Mantak Chia, Tzu Kuo Shih and Dong Zeng Chen are all considered grand masters in their own right and I am very grateful to have studied with each of them. Mantak Chia has an amazingly complete and complex system of meditation and qi gong including several levels of Iron Shirt Qi Gong, cultivating sexual energy, opening energy channels and even relatively simple exercises like the Inner Smile and the Six Healing Sounds, that are very powerful. 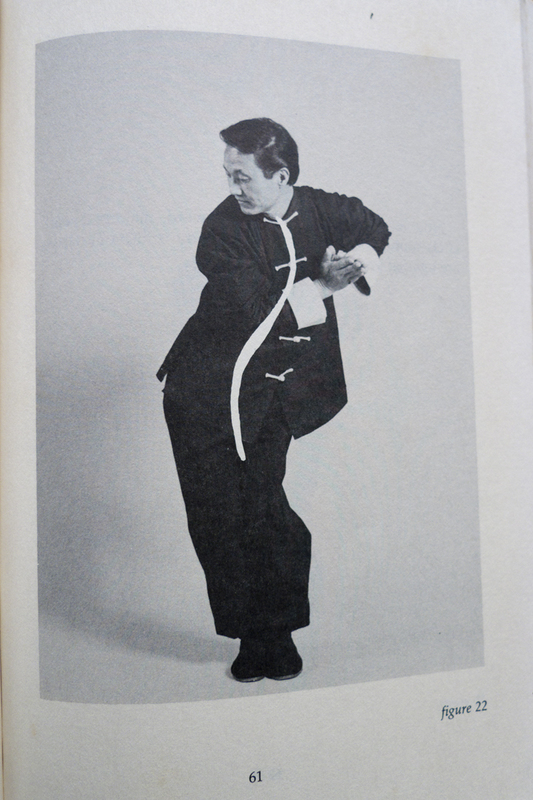 I loved Tzu Kuo Shih’s gentle personal energy and his deep knowledge, the wild Wudang taiji set and his Swimming Dragon Qi Gong is still one of my favorites. My twenty something years with Dong Zeng Chen deepened and expanded my practice of taiji including swords and push-hands, allowed me to teach and brought me many friends, students and great adventures during workshops and traveling in China with my Sifu. 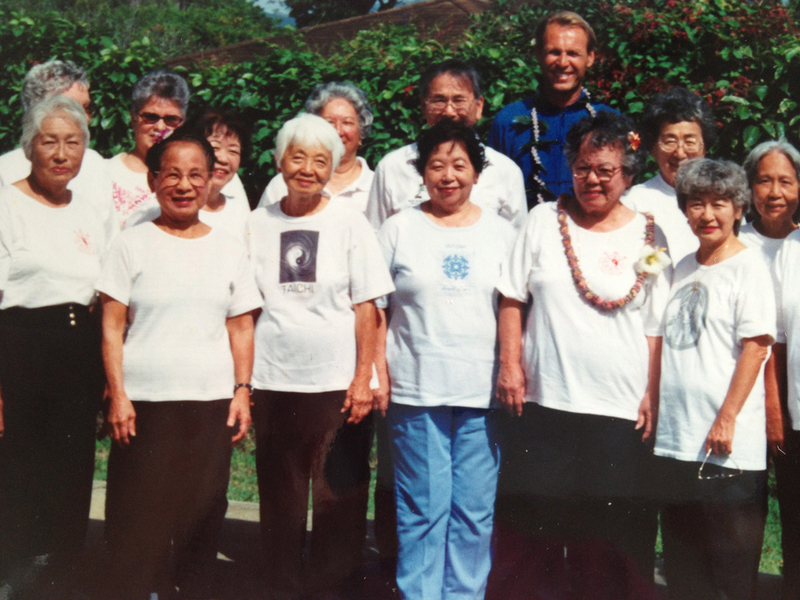 The author and some of his students getting ready for a demonstration at the Puohala Senior Rec Center, Kaneohe early 90’s. By now, I have been teaching Qi Gong and Taiji for more than 20 years and all I can say that taiji has always been very good to me. You can go as deep with it as you dare, with diligence and practice, getting to know your self better, be healthier and learn how to move with grace and ease. I will talk more about my travels with Dong Zeng Chen and my taiji friends in China in Once Upon a Time in China – The Art and Practice of Taiji Quan Pt 2. Here is a video of me demonstrating the Taiji Dao, the single edged sword in 2012. 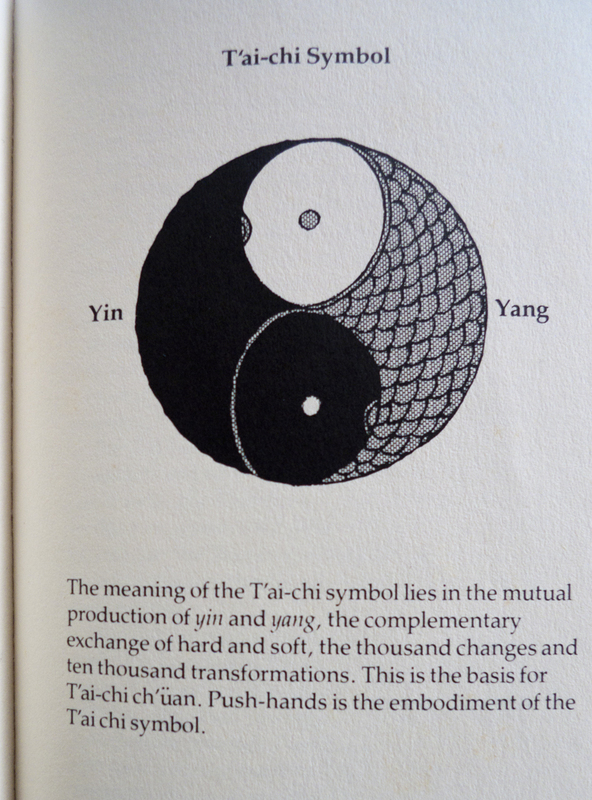 There is also a double edged sword, the first represents Yang energy and the second Yin. It is said that it takes one year to learn the Dao (single edge sword) and ten years to learn the double edged sword. This post is about the time in New York when I first discovered taiji. Here is a sword set by Jasmin Tung. I have been fortunate to hang out with her and have watched her do this sword set. The softness and the smoothness of her moves is amazing as well as deceiving, since it hides the internal power underneath it. Many people ask how taiji can be a martial art, if it is always so slow. Here is Dong Zeng Chen in 1987 demonstrating the Dong Family’s own Fast Set, that gives a glimpse of the explosiveness of taiji quan. The Wudang Mountains are one of the sacred sites of Daoism and considered the birthplace of the internal martial arts. 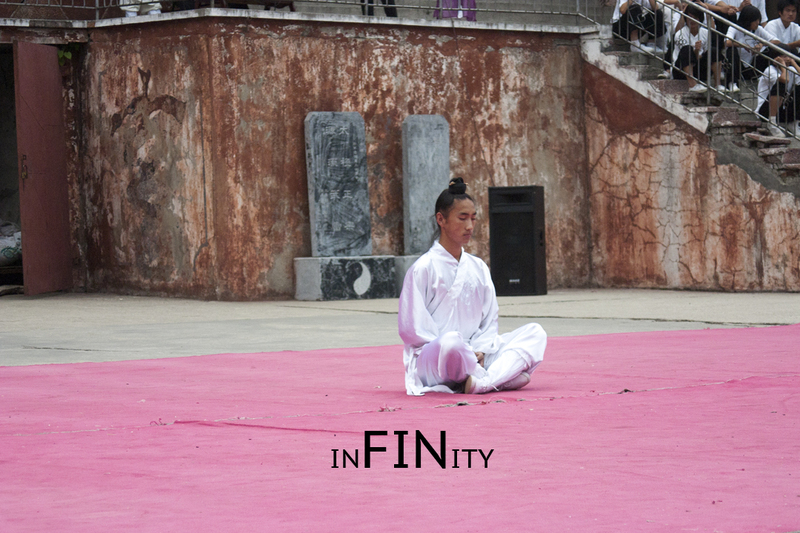 A student at the Wudang Internal Kung Fu Academy demonstrating a meditation position in 2008.